One of my favorite places is bookstores, old ones, new ones, libraries, basically anything that houses books. I love the smell of books. It is one of the best smells. Someday a perfume company is going to figure that out and make a cologne for men that makes him smell like a leather-bound book, and then that company is going to make millions. I know lots of women who love the smell of old books. It’s heady and comforting. Remember that men. If your girl likes to read, she probably likes the smell of books. Just sayin’. So my weekend has been spent around books obviously. Today I went to Barnes and Noble and spent, well, an inordinate amount of time there. I bought a book on meditation, a Shakespeare I didn’t have, a book titled The World’s Greatest Love Letters (which should be fascinating), and She Walks In Beauty by Caroline Kennedy. My public library had that last one and I borrowed it in November and I loved it, so I knew I had to get it. But, it was my Friday outing to my local Half Price Bookstore that was my treasure chest. I only bought three books from there but they were good choices I think. I bought a poetry anthology called Poems For The Millenium (can’t wait to finish my library books so I can get to it), this book called Quite Brilliant: A Celebration of British English (I’ve already started it and love it, a lot), and The Book of Positive Quotes which I bought expressly for the purpose of you guys. I wanted to have positive things to blog about besides my daily activities and my poetry/writing. And I am already in love with this book. It has wonderful things in it. Go find it if you can. It’s awesome. To be glad of life, because it gives you the chance to love and to work and to play and to look up at the stars; to be satisfied with your possessions, but not contented with yourself until you have made the best of them; to despise nothing in the world except falsehood and meanness, and to fear nothing except cowardice; to be governed by your admirations rather than by your disgusts; to covet nothing that is your neighbor’s except his kindness of heart and gentleness of manners; to think seldom of your enemies, often of your friends, and every day of Christ; and to spend as much time as you can, with body and with spirit, in God’s out-of-doors-these are little guideposts on the footpath of peace. Isn’t that wonderful? Each part gives you something to think about. I like the beginning where it says be glad. I used to have a tough time being glad of anything but lately, I’m finding it easier and easier as each new day passes. Every day there has been something good, even on the bad days. I don’t know if I just didn’t see them all the time or if I just couldn’t see them. I know they have always been there but I think we just get so caught up in everything going on around us, that we’re too busy to notice how many little positive things have happened to us. I know we say to appreciate life and take time to smell the roses, but I don’t remember anyone saying be glad of life. So I’m saying it. 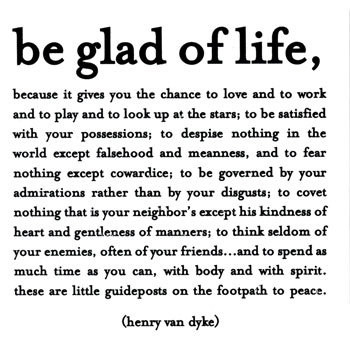 Be glad of life. Breathe in deeply and just be amazed at the fact that you can breathe air to begin with. (Unless you’re driving by a sewer or waste facility-then don’t breathe until you’re past it-no points will be deducted for being smart, in fact, you gain points for that.) We are absolutely miracles of life. The fact that we live and think and exist is a miracle itself. No matter what creation theory you believe in, you can’t deny that man is an amazing creature. We are the only life-form on the planet that has choice and will-power. We are the only beings that can change and think and be better than we are. We aren’t completely instinctual creatures. Be glad of that. Today’s post is a little on the short side but I’ve got rather a lot of reading material and I wanted to spend some movie time with the family so I hope you’ll forgive me for leaving you with a short blurb today. Tomorrow I’ll have a poem to post. Then back to our regularly scheduled posting. Have a great night all! Do You Have the Fire?